You are most likely familiar with the children’s rhyme and game “Ring Around the Rosie” with the final line being the title of this article. One would never think this might apply to an Episcopal priest, but stranger things have happened! On Ash Wednesday, the priest (Fr. Geoffrey Wild) and I were sitting in our allergist’s office waiting for our injections. An elderly friend and his daughter walked in and sat with us. The friend asked me if my husband would be distributing ashes at a service that day, and I told him he would be. The friend said he didn’t know if he could make it out to the church. 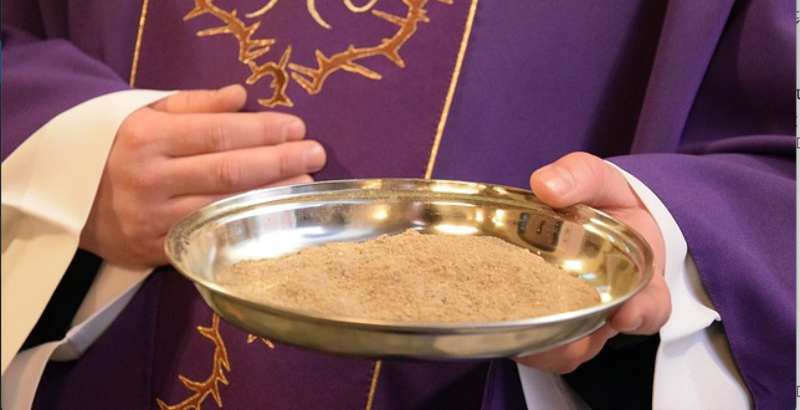 The priest-husband offered to get the ashes out of the car and impose them in the allergist’s office. The friend then asked if his wife could be given ashes – oh, and, by the way, she was in the emergency room of the hospital in the same building as the allergist’s office. Geoffrey said he would be happy to do so, so we departed and went to the ER to see our friend’s wife. I work in Mercer, PA, and Geoffrey drove me to work. He then went to a local nursing home to see one of our congregation members and impose ashes for her. She picked up the phone and called the charge nurse to let her know that Geoffrey was there. After he imposed ashes on the lady and her daughter, he turned around to find a line of folks of “all sorts and conditions” waiting to receive ashes, which he then imposed. The charge nurse told Geoffrey that there was a Roman Catholic priest who would appreciate ashes but who was unable to leave his bed. Geoffrey went to the man’s bedside and imposed ashes for the Catholic priest. Next Geoffrey drove to Foxburg where he imposed ashes in the church there. Quite a bit of snow and ice were around that day, and Geoffrey slipped and fell on the sidewalk that leads from the church to the parish house. He brushed himself off and continued on his way. His final stop of the day was at Church of the Epiphany where he held a Eucharist with, of course, imposition of ashes. Following the service, he joined my daughter and me for dinner at a local restaurant. As we were finishing the meal, he said to me, “I think I need to go to the ER!” I thought he was most likely in atrial fibrillation again – but no! He thought he had broken his wrist in the Foxburg fall! We sat in the ER (where Geoffrey had visited our friend’s wife earlier in the day) Following x-rays, we learned that his wrist was severely sprained but not broken. He received pain medication and a wrist wrap, and we were finally on our way home at 11:00 pm. At that point, he was in a great deal of pain. Strangely, he said, the pain did not start until we finished dinner and he had completed his priestly duties for the day! His wrist continues to be black and blue from that fall! We marveled at how this day unfolded as he traveled from place to place, doing God’s work. We laughed about the big line up of people at the nursing home and the Catholic priest receiving ashes from an Episcopal priest. Most of all, we thanked God for the many opportunities he gives us for ministry. Geoffrey will forever remember this day, a day when “Ashes, ashes, we all fall down” became very real for him. Cheryl Wild attends both Epiphany in Grove City and Memorial Church of Our Father in Foxburg, where her husband, Geoffrey, serves as vicar. She is also a member of the diocese’s Commission on Ministry. When you write, you can’t control how others interpret your words. Not completely, anyway. I was reminded of this after I wrote some reflections for Forward Day by Day. These are daily meditations on the lectionary that go out to Episcopalians all over the country. The responses I receive vary widely. Some people send me kind notes. Others use the reflections as a springboard for their own thoughts. After one mediation that briefly mentioned climate change, I received one long email questioning my belief that climate change is real. Ultimately, you can only put your work out there and hope that others will find it meaningful or useful, even if the words don’t always come across as you’d intended. This is true of every word we speak and our liturgy, as well. Take Ash Wednesday, for example. Some understand it as the beginning of Lent, a time of reflection. Some simply stop in the church to get their ashes before heading back out to work, a visible reminder of a deeply felt if not regularly practiced faith. Maybe they only go to church on Easter and Christmas. Others go to the Ash Wednesday Eucharist and will go again on Sunday, as they go every week. Likewise, some people understand Lent as part of a larger cycle of the year, and others simply think of it as they time they give chocolate up. We know that Episcopal liturgy is carefully considered. It is part of a long tradition and each element has meaning. The church should take that meaning seriously and do everything it can to teach people about what Ash Wednesday and Lent mean and help them use that season fully to deepen their spiritual lives. But ultimately there’s only so much you can do. Many people will stop by to get their ashes without fully understanding the tradition behind it, but that doesn’t mean that God can’t work with that. And if some people give something up for Lent and do nothing else, maybe their lives will be improved in some way. The liturgy of the Episcopal Church, the prayers and songs and the theology behind them is a great gift that the church has to offer. Not everyone has the time or inclination to learn about the meaning behind our liturgy or participate fully. We can’t control how people experience and understand Lent, nor should we try. Ultimately, we can simply offer what we have and let go, and hope that others find meaning and hope in it. Occasionally, it helps to ask ourselves: Are we’re holding on too tightly to our traditions? Are we insisting that others understand them as we do rather than allowing the spirit to do its to work? Click here to find a church and get your ashes. Click here to see an Ash Wednesday video. About Sin and Ash Wednesday; a Testimony! Ash Wednesday morning sitting in the chapel of St. Stephen’s, Fairview, watching the beautiful snow fall at different paces, listening to the familiar words of the Ash Wednesday Liturgy I became mystically aware of my own sinfulness. The many patterns of sin true for all of us were true for me as well and stuck out like a beautiful cardinal against the backdrop of a grayish winter day. Just as easily my consciousness wished and willed them to fly away in search of roosting somewhere else, but that wasn’t what Jesus had in mind for Ash Wednesday. All sin, the monk said, points towards good things. My deepest yearning is for love; a special love desired at a young age and absent; a special love that becomes the object of a lifelong search. The objective of sin is always good. It’s the methodology that causes problems. Throughout my life this yearning, perhaps placed by God; more likely initially placed by God and further fueled with desire in part due to my family of origin; this yearning, this vast sea of emptiness became an obsession in hopes that somehow and miraculously the yearning would be removed through the right therapy, the best spiritual experience, or the perfect relationship. This didn’t come from the outside, however, this all came from the inside and as Jesus says it’s what comes from the inside that causes us difficulty. Imagine the pressure on the people around me. Sins are old friends. We tend to have the same ones and repeat them over and over again. If you have a yearning as I do, then you know the many ways one might go about trying to satisfy such a vacuum. Mind you; we don’t want to repeat them it’s just that our needs sometimes outweigh our wisdom and we crack; we break and unbeknownst to us we are broken more. That’s what unrecognized sins do: they break ourselves from the inside out. Once we see the sins we repeat again and again and once we listen to the sins of others we learn that we have much in common with our brothers and sisters in this life and in this world. “All sin and fall short of the glory of God.” One author said these sins are like a rock we carry around with us wherever we go. Others look at us and wonder why we just don’t drop the rock. Well, first of all, we might not be able to see the rock we are carrying; or we may be more comfortable with the rock albeit it burdensome; or we’re convinced no one’s sins are as great as our own. Ironically we can even be special in our sinfulness. The yearning will not go away and thus the beauty of the ashes. Jesus’ redemption now helps me see that the yearnings of my heart are an essential part of who I am; Jesus actually loves me through and with the yearnings. And His redemption is that there are other ways to live with the yearnings of the human heart that don’t break us and don’t involve sin. But to get there one must first be honest and while the snow was gently falling outside St. Stephen’s in Fairview the Beloved sat next to me, held my hand, and said, “You shall know the truth and the truth shall set you free”. There was a loud sound; beware of falling rocks.